Robotic Process Automation (RPA) is becoming increasingly important to business as a new way to accelerate digitisation and improve productivity, reduce costs and errors. In a recent global study of nearly 600 companies, Softomotive found that roughly half were looking at RPA and the other half had already started their RPA journey. Yet the full potential of RPA is yet to be realized due to some fundamental flaws being exposed, notably hidden costs, the difficulty of maintaining momentum once easy to identify processes have been automated and the lack of people engagement. - Innovate to empower the many and accelerate performance collaboratively. - Incubate to filter and nurture the best output from the innovation phase. - Implement to scale what is proven to work. The first two stages are the real difference between a People1st Approach and conventional thinking on RPA which so far is overpromising and underdelivering. “A People1st approach for process automation places the power of innovation firmly into the hands of those who are best placed to know what is needed and how to do it – the people that do the work. In a People1st world, everyone is a “Citizen Developer” because they know best what works and what does not “said Marios Stavropoulos, CEO and co-founder of Softomotive. The Softomotive People1st Approach is based on a new business model for RPA which is built around each of these three stages. Each phase is broken down to different steps to provide a 7 stage blueprint for the adoption of this new approach. 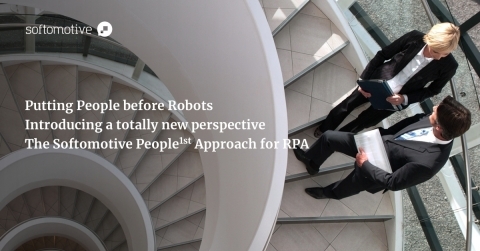 To discover more about the Softomotive People 1st approach for RPA and this new business model download the Executive guide or the Practitioner’s guide for further details. For more information about the People 1st approach visit: www.softomotive.com/People-1st-Approach.